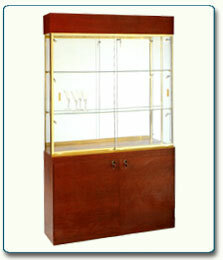 This rectangular product cabinet features a display area as well as convenient storage space. It has 2 adjustable, tempered glass shelves with a mirrored back and laminated deck. The locking bottom storage area also features and adjustable shelf. Shown in rosewood laminate with gold anodized aluminum framing, this product cabinet is available in all standard finishes and custom finishes are available upon request.